A note on the benefits of standing desks: Recent scientific research has shown that after a meal, blood sugar levels return to normal faster on days a person spends more time standing. I've found that standing at a desk also causes me to be less likely to slouch, improving my posture and reducing shoulder and back pain. Standing for extended periods of time at work also promotes a shift away from a sedentary lifestyle (and a sedentary lifestyle comes with a high risk of obesity, reduced metabolism and heart disease). As standing desks have grown in popularity, so have the need for accessories that increase their utility. I've recently experienced this for myself. Having obtained a standing desk at work, I found myself standing at upwards of 6 hours everyday. It felt great initially, really but after a while the soles of my feet smarted and ached. Armed with the knowledge of the disadvantages of standing too long without mitigation, I decided to get an anti-fatigue mat for my standing desk. Enter the CubeFit TerraMat: because it was on sale on Amazon (for US$79 excluding shipping), and I had read some good reviews about it online, I decided to buy it. This particular anti-fatigue mat stood out because of its "3D terrain" features, which basically means that it has an ergonomic surface design that allows you massage your feet, stretch, and generally encourages shifting your feet while standing. These features all mitigate the risk of standing in one position for too long, and generally improve the comfort of standing up for extended periods of time. The mat works by providing "zones" that encourage you to subconsciously massage your feet on them, keeping your feet active (instead of standing still). The zones on the CubeFit TerraMat. What makes the CubeFit TerraMat stand out from other anti-fatigue mats, which are generally comprise a flat surface of foam, are the various zones on the mat. Putting one foot on the power wedge and the other on the balance bar allows you to stretch your calves and hip. The balance bar, pressure peaks and massage mounds provide options to massage your feet in various positions. The support track allows you to move freely without unknowingly slipping off the mat. Putting one foot off the mat on the support track also allows allows you to stretch your hamstring. There are a variety of ways to use the zones on the mat, and I've been discovering my personal preferences with more use. Generally, when standing, I tend to rest my weight more on one foot than the other. As the foot gets tired, I'll switch and rest my weight on the other foot. With the zones on the mat, I'll fidget around with my other foot. WIth the anti-fatigue mat, I've found myself subconsciously moving the fidgeting foot onto the massage mound to massage the arch of my foot (I have slightly flat feet) and the ball of my foot. The balance bar serves a similar function. Every so often, especially if my feet are aching (for example after a long weekend of walking), I'll press the ball of my foot against the pressure peaks. The pressure peaks remind me of foam massage rollers for your feet, and the "bumps" do a good job of massaging your feet. When I need to stretch a little bit, I'll find myself subconsciously stepping backwards onto the power wedge (and support track) with my heels, massaging my heels and stretching at the same time. You can see above that the word "subconscious" is used a number of times. This is because the mat really encourages my feet to move actively. Without even realising it, I'll continually shift my legs and feet without being distracted (you can see this in our timelapse video below). This mitigates one of the greatest risk of standing too long, which is muscle fatigue and varicose veins, because it relieves the limbs from continuous pressure. Our timelapse video of usage of mat over a period of 15 minutes. You can see that it seems to encourage subconscious but active movement. The mat is made from polyurethane foam, which has a spongy but firm feel to it. When I first stepped on it, I was surprised that it didn't feel more cushy and soft. But over prolonged use, it made perfect sense - the firmness of polyurethane foam apparently stimulates "proprioception". Proprioception is the perception of stimuli from your nerves, and it's part of how your body determines its own position, movement and acceleration. It appears that the firm bounce on polyurethane helps stimulate the nerves in the joints of your feet, helping your body better perceive its position. Research has also shown that standing on polyurethane anti-fatigue mats significantly reduces spinal compression (one of the disadvantages of working while standing) as compared to not using a mat at all or using a mat of softer material. In contrast to my first impression after stepping on the mat, my first impression of the massage mounds and balance bar was that they were too squishy, almost as if they were lacking support. With more use I've grown used to the feel of these features and appreciate the relative softness now. It allows me to press my feet against them longer without getting sore, meaning more subconscious massage time. The TerraMat is about 74cm wide, 68cm long and has a depth of about 2cm. The various features go up to 9cm tall. Because the TerraMat is roomy, there's plenty of space to stand naturally. The features aren't too far apart, so it's still possible to press your feet against them without contorting your body. 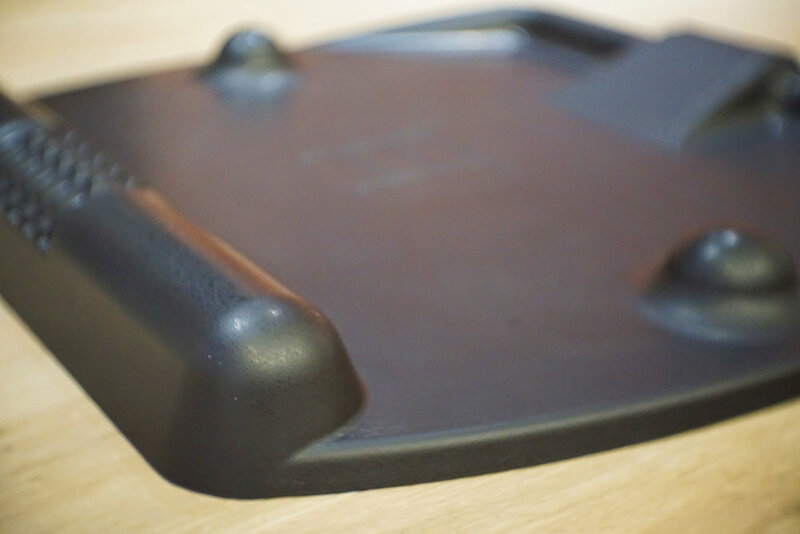 The anti-fatigue mat is spacious, with plenty of room to stand comfortably. Using the mat over time, I can say that it really is much more comfortable than having to stand without the mat. I had been using a standing desk for about 2 weeks before the mat arrived, and my feet got sore very quickly. The TerraMat quickly resolved this. After more than a week of standing upwards of 6 hours everyday (and using the mat), I've not had any issues with muscle fatigue or sore feet. The TerraMat is easy enough to use - just stand on it. But there's more to convenience than just using the mat. The mat has dimensions of about 74cm x 68cm and is quite large. When not in use, the large size of the TerraMat might cause it to be a tripping hazard. Thankfully though, it is made of 100% polyurethane, which is a smooth material that doesn't slip easily when it's pressed against the ground. When no weight is applied on it, I can very easily use a foot to slide the mat (on carpeted floor) all the way under my desk. Just like that, it's out of the way and no longer a tripping hazard. On the other hand, when I stand on the TerraMat, my weight is more that sufficient to create a large amount of friction between the mat and the carpeted floor. The mat never slips or even hints of shifting when I'm standing on it. When paying this much for an accessory like a standing desk mat, you would want it to be durable and long-lasting, otherwise it'd be a terrible investment. Based on my short-term use so far, it doesn't look like it gets damaged easily. More importantly, it's completely made out of a high-density polyurethane foam. Polyurethane is known to be very durable and has high abrasion, impact and tear resistance. It doesn't stain easily and doesn't lose its firmness over time. It's also chemically inert so there's no concern with any toxicity (there was no "plastic" smell either). I'll update this post if I notice any change in durability over prolonged use. The CubeFit TerraMat has been useful, and even essential, for me as an accessory to my standing work desk. My feet are no longer sore and, as an added benefit, I'm constantly shifting my legs around without being distracted, increasing activity and minimising strain. While there are other alternatives that are equally good or maybe even better (the ErgoDriven Topo mat is a notable one), the CubeFit TerraMat serves its purpose well and is perfect for my needs. Do we enjoy the smart life with this? Yes, but only at a standing desk. Who should buy this? Anyone who works at a standing desk. Who shouldn't buy this? Anti-fatigue mats are really niche products - if you don't use a standing desk you don't need one.